Got to be German – Time for: Reibekuchen! As some of you may know I grew up in Germany and I grew up knowing some of this typical German food. This here is something that my grandma used to make whenever all grandchildren came around hers – not particularly healthy as there is a lot of oil needed to make these, but absolutely delicious! 1. Shred the potatoes (make sure you use the right type of potatoes for this!). Get rid of the access water from the potatoes as this would make them too watery and they will not stick together. 3. Combine and add the salt pepper and nutmeg. Feel free to add more herbs or spices – this is down to your personal preference! 4. Add the flour and mix well. 5. Form little patties and fry in a large pan with vegetable oil (rapeseed or similar, something without a strong taste) – et voila: Reibekuchen! 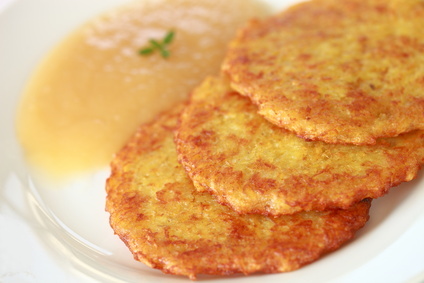 Serve with ready made apple sauce – or even make your own apple sauce to go with it.